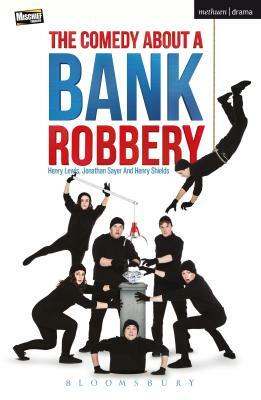 The Comedy about a Bank Robbery (Modern Plays) (Paperback) | The Drama Book Shop, Inc. Written by Henry Lewis, Jonathan Sayer and Henry Shields of Mischief Theatre, creators of the Olivier Award-winning Best New Comedy The Play That Goes Wrong and Peter Pan Goes Wrong, The Comedy About A Bank Robbery is the latest adventure in mishap, mistimed exists and entrances, and disaster unfolding in front of the audience's eyes. It received its world premiere at the Criterion Theatre, London, on 31 March 2016. Henry Lewis, Jonathan Sayer and Henry Shields are members of Theatre Mischief, a company dedicated to creating engaging and exciting short-form and long-form improvised theatre of an excellent standard through well-honed improvisational technique and strong theatrical ensemble work, formed of students and graduates of the London Academy of Music and Dramatic Art (LAMDA). Founded in 2008, the award-winning company has performed around the UK, creating new long-form and short-form show formats to thousands of people. Their plays including The Play That Goes Wrong, Peter Pan Goes Wrong and The Nativity Goes Wrong.